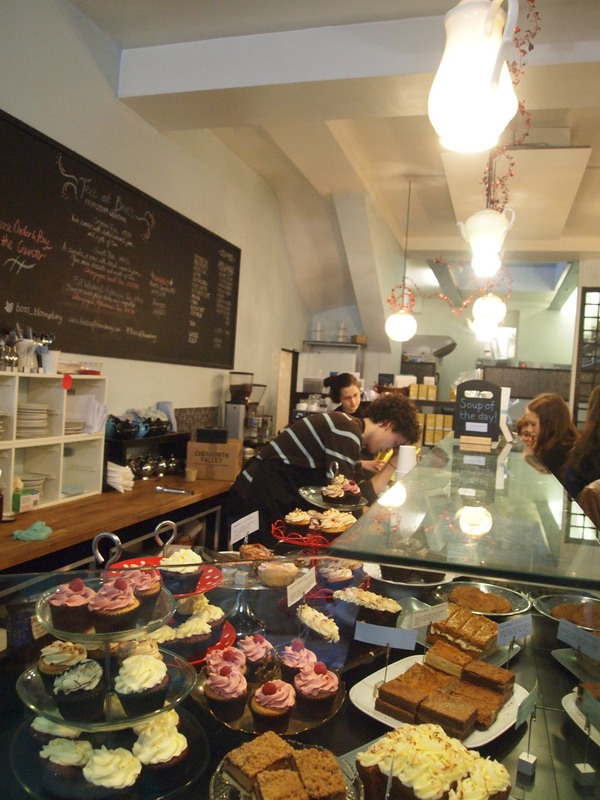 finally got to try the much talked about Bea’s of Bloomsbury today! a friend was visiting from dublin, and we had a great catch-up over some cake and tea at this little shop just off the busy holborn stretch. 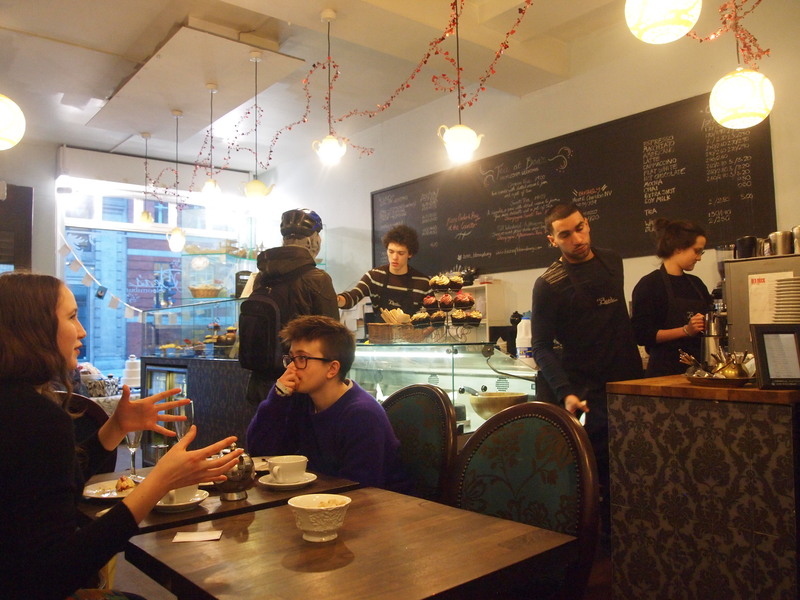 it was a lovely afternoon spent in a warm and cosy cafe, seeking shelter from the freezing cold outside. when is spring coming??? 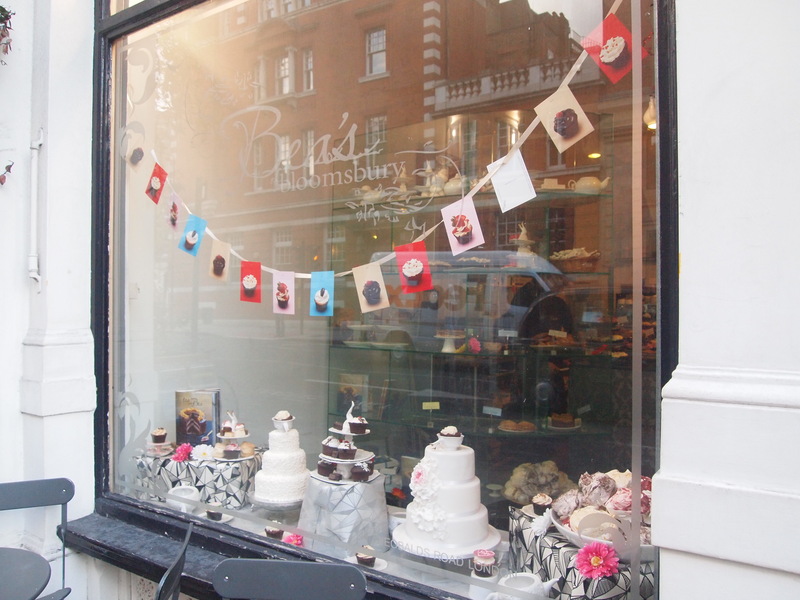 you won’t miss it as you make your way down theobalds road; the shop window is filled with sweet treats and according to a friend who had been before, it was even more decked out the last time she visited! they have a full afternoon tea that goes for £19 per head, but we opted to order individual items as we weren’t quite up to a full-blown feast (and the exercise that we would be obliged to do/guilt-tripped into doing after!!!). 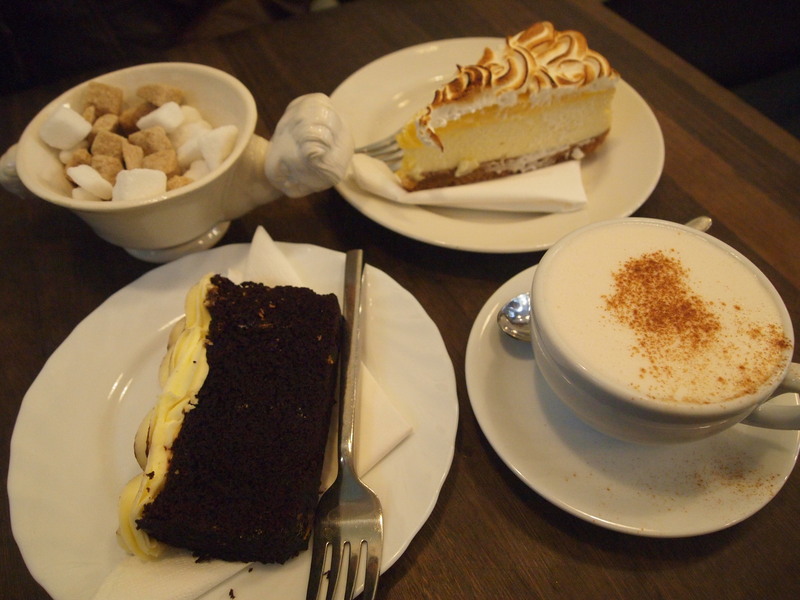 after some serious deliberation and inspection (life-changing decision right here) of the whole range of cupcakes, muffins, brownies, and cakes on display, we settled for a guinness chocolate slice (recommended by the waiter) and a slice of lemon meringue cheesecake. my first thoughts on the guinness slice were that it was a bit dry, the kind of dryness that results from being left out in the open for too long. but luckily it turned out that it was only that way around the edges; after having more of it, i realised it was rich & dense but not heavy, and had the perfect amount of chocolate in it! i’m not normally a fan of chocolate cake since i dislike the feeling of “chocolate phlegm” (sorry for the gross description – i really can’t think of any other way to put it!!!) at the back of my throat but that did not happen at all with this slice – it was GOOD STUFF. as for the guinness, i couldn’t really taste much of it but perhaps that’s what makes the slice so appealing – a subtle hint of guinness combined with the perfect amount of chocolate-y goodness. YUM. oh and the icing went perfectly with the cake as well; i thought it wasn’t too sweet and topped the slice in just the right amount. LEMON MERINGUE CHEESECAKE: i enjoyed this cake so much that i felt the need to type its name in caps!!! 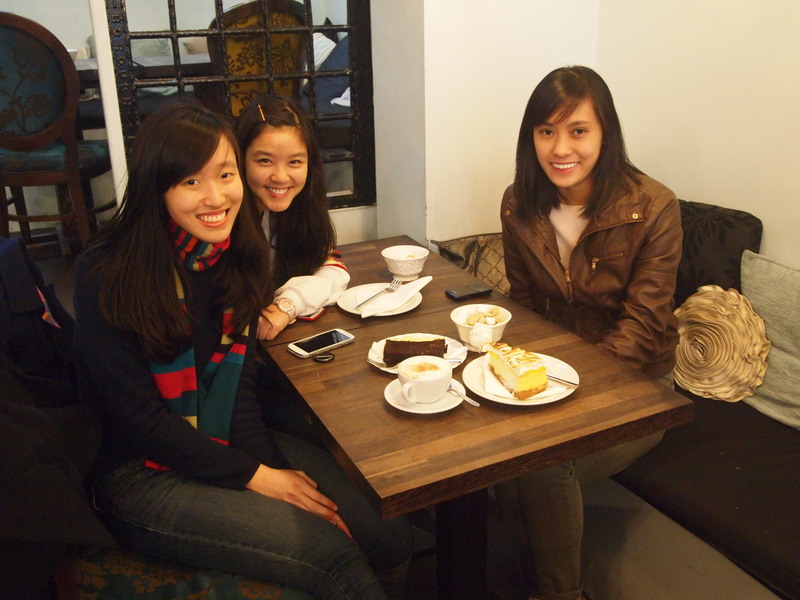 the three of us at tea all agreed that it was divine!!! the meringue on top wasn’t too sweet or sour, and it was the perfect texture. 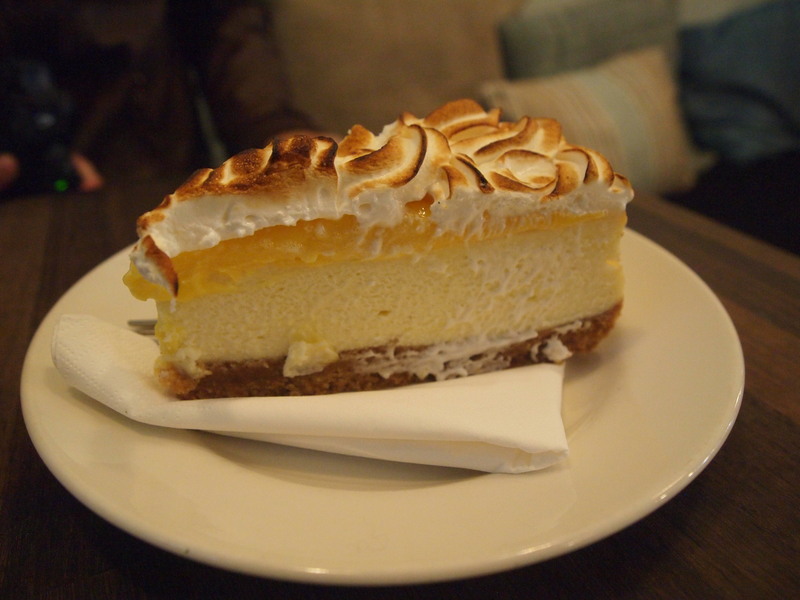 the cheesecake middle was amazing – it was moist and rich but yet light such that you wouldn’t get sick of eating it, and the proportion of meringue top to cheesecake to digestive base was just right! LITTLE (okay not really little; the slice was pretty big!!!) SLICE OF HEAVEN RIGHT HERE. my two friends can attest to the fact that our conversation kept getting interrupted with my random interjections of “omg, this is SO. GOOD.” after every mouthful… oops! i also ordered a chai latte, and it was delicious; probably one of the best chai lattes i’ve tried! (i’m not a big coffee drinker so this is the drink i normally go for) perfect for a cold winter’s day. it had a generous dose of cinnamon and the perfect amount of spice to it, and i thought it was a rather generous serving despite me ordering a “small”. it was frothy and yummy and super drinkable; i will definitely be going back for more! service: good! patient and friendly service staff behind the counter. 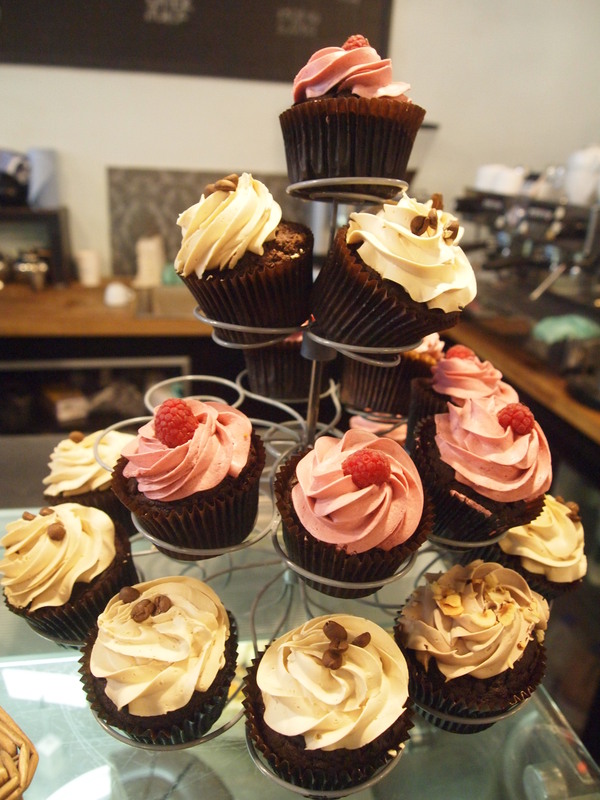 who i would recommend this to: anyone with a sweet tooth looking for a nice cafe to have a little feast on sweet treats. the place is rather small though, and i can imagine it getting crowded on weekends so probably best to avoid going in large groups over the weekend. will i return? YES! the cakes were delicious and there are sooo many more i didn’t get to try. i believe the menu and their offerings change pretty regularly as well, so that keeps things nice and exciting. might also head back to try their savouries that they serve at lunch time! 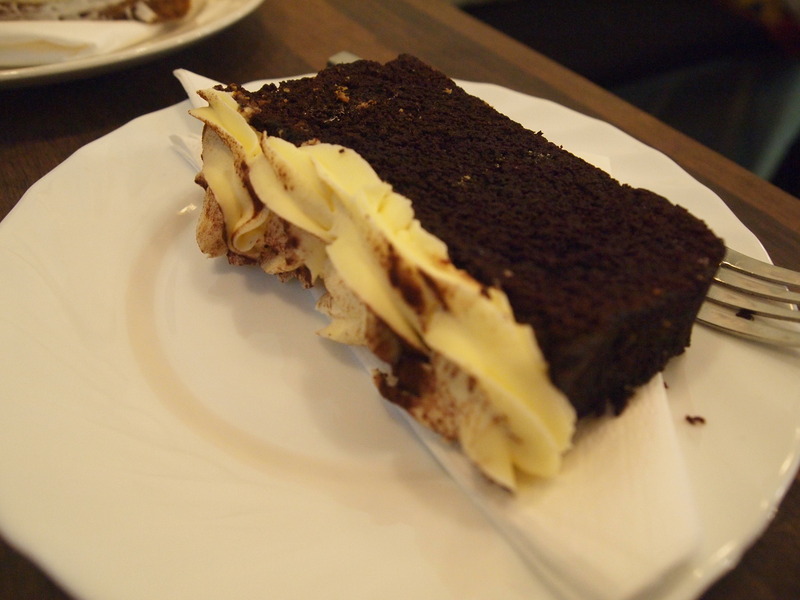 This entry was posted in Cafe, Cake, Coffee, Dessert, Tea and tagged afternoon tea, bloomsbury, british, cafe, cake, Cheesecake, Chocolate, cupcakes, dessert, high tea, Lemon meringue pie, london, patisserie, review, sweet treats, tea, Theobalds House by nicjorach. Bookmark the permalink.